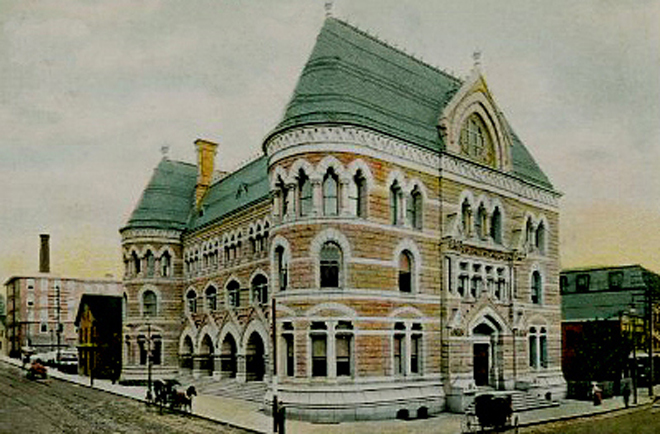 The post office in Almonte, Ontario, perhaps the only town in Canada named for a Mexican general. The citizens of the town distrusted the United States, an antagonism that went back to the War of 1812, and since General Juan Almonte had fought in border skirmishes against the U.S., in 1856 they named the town in his honor and sent a message to their neighbors. Today, the town’s name is pronounced “AL-mont” but the General is not forgotten. 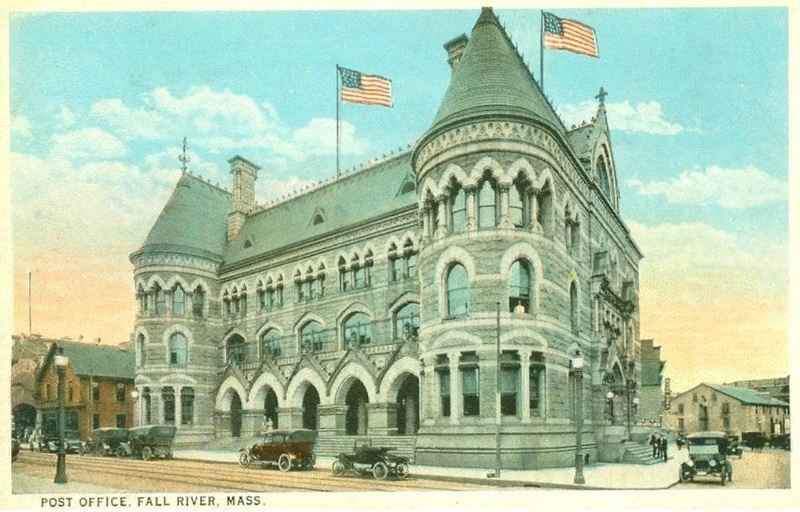 Fall River, Massachusetts, is famous for more than Lizzie Borden. 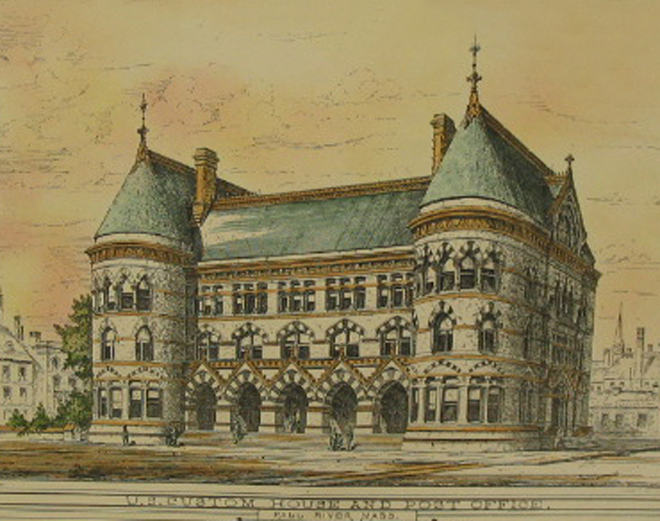 It was once a booming mill town and port city, and thus merited a spectacular post office and custom house, shown in postcards and, below, in an architect’s drawing. Today, the building is gone but its ornamental medallions, carved by Thomas Richard Kessel in 1880, grace the gardens of the Fall River Historical Society. Port Arthur, Ontario, was named, in 1870, for Prince Arthur, Duke of Connaught and Strathearn, the son of Queen Victoria, then serving with his regiment in Montreal. The city sat on the shore of Lake Superior’s Thunder Bay until 1970, when it was absorbed into the municipality of Thunder Bay. I love post offices with palm trees, but this one provided so much more in the way of a story. The original Fort Myers, built to protect the encroaching settlers from the Seminole Indians they were displacing, was named by General David Twiggs for his soon-to-be son-in-law, Lt. Abraham Myers. Myers was a graduate of West Point (1833) and served in the Seminole Wars as a quartermaster, and in the Mexican War; he remained with the U.S. Quartermaster’s Department until 1861, when he surrendered the U.S. supply depot at New Orleans to the seceding state of Louisiana, and became Quartermaster General of the Confederacy. His tenure was not crowned with success. Historians still discuss whether he was incompetent or doomed by bureaucracy, profiteering and infighting. One example from hundreds: His department played tug-of-war with the Ordnance department over animal hides; Myers needed leather for shoes and harnesses (for horses pulling wagons); Ordnance wanted leather for cartridge boxes and harnesses (for horses pulling artillery). Some maintain that it was shoes that precipitated the Battle of Gettysburg and Myers’ final fall from grace. The Confederate Army badly needed shoes, coats and blankets for its troops, and believed there might be supplies in Gettysburg; there a southern scouting party encountered Union forces, and the engagement turned into a battle. This comment, said to be typical of the sharp-tongued Mrs. Myers, was only one salvo in a long war between the leading ladies of Richmond. But given the fact that Varina Davis had a dark complexion and a generous silhouette, the remark was oft repeated, not forgotten and never forgiven. The enemies of Mrs. Myers, on the other hand, had long sniped at her husband as a Jew. Abraham Myers was the great-grandson of Charleston’s first rabbi, a descendant of an old Jewish family that settled in South Carolina generations before the war. More than 10,000 Jews fought for the Confederacy; Robert E. Lee allowed his Jewish soldiers to observe all holy days. But this did not spare Lt. Col. Myers from suggestions that he enriched himself with his office, owing his first loyalty to “the party of Moses” and “the tribe of Levi.” Marion herself was said to be from “the Lost Tribe” of Israel. Blamed for losses on the battlefield, and losing the war in the parlors of Richmond as well, Abraham Myers was passed over for promotion and replaced as Quartermaster General. Between that and being on the wrong side in the Civil War, he pretty much lost everything. But he would always have Fort Myers, Florida. The post office in Stretton-on-Fosse, Warwickshire, circa 1900. And in the photo below, from the 1890s, the older woman is believed to be Judith Wells, the mother-in-law of James William Edgington who ran the post office, and who was also a licensed dealer in tea, coffee, tobacco and snuff. Images from Windows on Warwickshire, long may they prosper. A 1950s-vintage photo postcard of the post office in Yogyakarta City, in Indonesia’s smallest province, Yogyakarta, on the island of Java.